In the charming malt house in Berlin, the 3rd Utopia conference was held from 27-28 October, 2010. This year, I had the honor and immense pleasure of co-hosting the event with my wonderful colleague Britta Sander. For two days, internationally renowned speakers like Bianca Jagger, René Obermann, Renate Künast and Hannes Jaenicke presented their ideas, visions and projects for a more sustainable world. In front of 500 guests in the audience and over 10.000 watching the online live-stream, the speakers discussed how all of us can contribute to a better world through a fair and sustainable lifestyle. 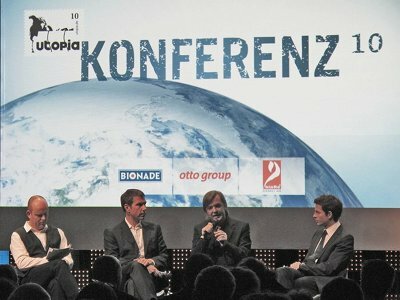 More information about the speeches and pictures from the conference can be found on Utopia.